Cloudy. A stray severe thunderstorm is possible. Low 47F. Winds WNW at 10 to 15 mph..
Cloudy. A stray severe thunderstorm is possible. Low 47F. Winds WNW at 10 to 15 mph. Davenport's Blackhawk Hotel served as the Isle of Capri's hotel until a fire destroyed one floor and damaged several others on Feb. 11, 2006, forcing its closure. Restoration St. Louis — which has built its reputation by renovating older, challenging buildings in some of the Missouri city’s neglected historic areas — is Davenport’s preferred partner for redevelopment of the empty Blackhawk Hotel. The company began as a small-scale, husband-and-wife operation in 1990, but it has grown to a 100-employee development team that owns and operates more than 1,000 residential apartment units. It was one of three that responded to the city’s request for qualifications in the fall. Last week, Davenport officials confirmed that Isle of Capri plans to sell the abandoned Blackhawk back to the city for $1. The city then would transfer ownership to a redevelopment partner. Two Davenport aldermen confirmed that Restoration St. Louis is the partner. With the Isle expressing interest in moving its gaming operations into the 80,000-square-foot RiverCenter South, the type of renovation that would fit best in the historic hotel needs to be determined, City Administrator Craig Malin said. That would work for Restoration St. Louis, said Phil Estep, a development consultant who works on the company’s rehabilitation projects. In St. Louis, the company restored the long-vacant, 15-story Coronado Hotel, which dates to the turn of the century. It went from an empty shell to a thriving building featuring 64 apartments, a first-floor restaurant and patio cafe, high-end convenience store, fitness center and renovated ballroom that is used for receptions and corporate meetings. A boutique hotel on some floors of the Blackhawk is also a project that Restoration St. Louis would explore, Estep said. If the RiverCenter and its associated attraction of visitors to larger-scale shows and conventions is out of the picture, that must be factored in, Malin said. A 2004 study conducted for the city by HVS Convention, Sports & Entertainment Facilities Consulting of Chicago, indicated the need for 200 more hotel rooms to maximize the convention potential of the RiverCenter. Malin said at the time that it was clear the city had over-built its convention space without the hotel capacity to serve it. Any expansion would have to make economic sense and tie in with the Isle’s plans, Malin said. Alderman Shawn Hamerlinck, 2nd Ward, said he is impressed with Restoration St. Louis’ track record, but he needs to be certain the city will not get stuck owning the aging hotel. Malin said negotiations with the Isle will continue this week, and he’s hoping to have a document spelling out the company’s intentions in the near future. 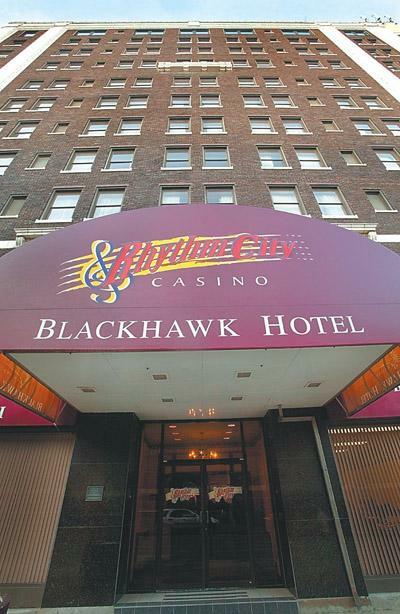 “I expect that the city will make it clear to the Isle of Capri that their prompt release of the Blackhawk Hotel to a qualified redeveloper is something the city has a strong interest in,” he said. Malin noted that Restoration St. Louis executives have been in Davenport several times and toured the Blackhawk. Restoration St. Louis was born in 1990 when husband-and-wife team Amrit and Amy Gill bought a dilapidated three-family apartment structure in midtown St. Louis and renovated it. Since then, the Gills have helped restore dozens of buildings in older, formerly upscale areas and some of St. Louis’ toughest census tracts. The company recently completed the renovation of the 15-story Coronado Hotel in midtown St. Louis. In addition, the company has purchased more than 60 properties — most of them abandoned commercial buildings and vacant lots — that it is rehabbing in the city’s Forest Park area.